Make School is a college that has removed most of the traditional barriers to people of less privileged backgrounds from getting an elite computer science education. We offer schooling for no upfront cost, instead people pay their tuition after they get a job that pays over $60K. We offer living stipends to anyone who needs with the same deal. Also we don’t look at SATs or GPA for admissions. Being as inclusive as we are means that our students come from all backgrounds racial, economic, and social. And because the school literally succeeds or fails based on the students’ achievement means we have a mandate to make every single one of them a success. No matter what. Here are 10 things that I’ve learned work well to put underprivileged and underrepresented students on even footing with privileged white folks in America. In my experience, providing real-life, living, breathing role models for students supercharges their motivation, focus, and mindset. The role models should simply look like the students and come from a similar background. Living famous people work better than dead famous people, but real people they can meet and talk work the best. Research has shown that black students who had ONE black teacher before the 5th grade had a much higher completion of high school and inclination towards college. Likewise, Microsoft conducted research showing that girls showed double the interested in software engineering if they could meet and interact with a real life woman engineer. Don’t be shy to put role models together who share similar backgrounds. The research shows this matters. Girls don’t get 2x more interested in engineering if they meet a man who is a software engineer! Role models matter. It is worth the effort for your school to put together a role model program for all students but prioritize and track underrepresented students getting a role model from their background. Grades, it has been shown, are a better indicator of long term student success, not standardized tests. Also standardized tests are a better indicator of student privilege than they are indicators of a student’s ability. Offering to admit based on public portfolio is also better and more inclusive than standardized tests. Be sure to provide exemplar portfolios so students see the breadth of what can be included in these. If we want our college to promote equity, then we also need our college to support our students being employable after training. To do this, start measuring the economic outcomes of your college and then take steps to improve the metrics. How to measure economic outcomes? The important thing is to see if students are on track to be less rich, equally as rich, or richer than their parents. This is important because if a college education only makes people as rich or less rich than their parents, then maybe the college isn’t advancing the student much at all. So, to get a baseline, break up students into various groups based on privilege, representation, and major, this can be done pretty easily with financial aid data and by stated race and gender. Then track what their employment status and salaries are after they graduate for 5 years. Anonymize this data and make it available to the public and all incoming students so they can pick majors that support their economic success if that is what they value. Income share agreements means students only pay after they get a job. Using ISAs to finance your college begins to align incentives throughout the school to serve students instead of blaming them. It goes a long way to denormalizing failure, and can dramatically improve the outcomes for all populations including underrepresented and underprivileged folks. Implement income share agreements to enhance financial aid or even just totally replace tuition with them. If you measure people’s economic outcomes, now you can offer income share agreements based on their majors which will further attract people (and funding) into majors that have great outcomes. The pretension is so thick you can cut it with a knife when people make the distinction between “vocational” education and “college” education. Most people go to college to get a job. They don’t go to float their brains on a cloud of Aristotelean philosophy. If they want to do that they can go to my college. Parents who are paying tuition expect the college education they are buying for their children to turn into gainful employment. Making arbitrary distinctions between what is vocational and what is not is wasteful navel gazing. Instead just focus on creating value for students and their families and communities. Engage continuously with your students and faculty in the evolving conversation about what is valuable to learn. Weed out classes have been shown to “weed out” underprivileged and underrepresented people. Start by looking for any self-proclaimed weed out classes and change them so they are supporting people to start a discipline, rather than removing the least prepared people. Next look at the metrics of which intro classes have the greatest attrition and assess them to see if they have the characteristics of weed out courses. Be sure to take into account the economic value of the major that people are leaving. If the major has a high economic value and many underprivledged and underrepresented people are leaving it, that probably means that there is a bottle neck that needs to be redesigned to support student success. College teaches very few skills that are valuable to students in their real life. Last time I checked, there is no major in Parenting. And most college students don’t know the first thing about insurance, credit cards, real estate, or a thousand and one things that everyone in our society needs to know. Underrepresented and underprivileged people especially are lacking in these skills because they are not getting them informally from their families and network of privileged contacts. If you want to support all populations, but especially underpriviledged and underrepresented populations, bake training into these seemingly obvious “adult” skills into core curricula, and don’t let anyone graduate who can’t do their own personal finances. Here is a very, very short cut into RP: the restorative questions. 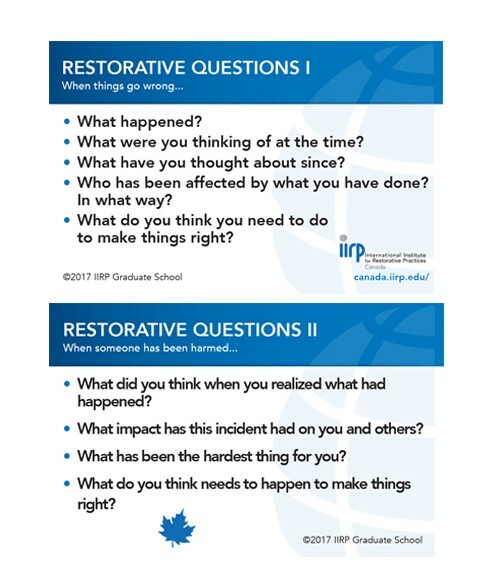 Anyone can use these questions in disciplining situation to transform some bad behavior into an excellent learning experience for the wrong doer, those harmed, and the facilitator. To get certified in RP head on over to the Institute of Restorative Practice. Or buy this lovely book Beyond Carrots and Sticks. Much of the educational disenfranchisement that happens throughout the educational system happens due to claims to “rigor”. If a college is not rigorous it must be a bad college. If a course is not rigorous it is a bad course. This is not only false, but it is quite harmful to our society and many people in it. Instead of focusing on rigor at all levels, make on-ramps into disciplines that have the most rigor at the top most courses. Also a lot of “rigor” has no relationship to anything in reality. If an English department requires people write 50 page analytical essays of 19th century literature, that is very unrealistic and out of sync with the work masters of the English language actually do in our society. Masters of English write novels, radio stories, journalistic pieces, histories, ad copy, and public talks, speeches, and presentations. It is not “rigorous” to demand people do something that is completely unrealistic. Ask for student feedback and publish the results. Take action to fix things that are broken, stop doing things that hurt people, and start doing things that help them. 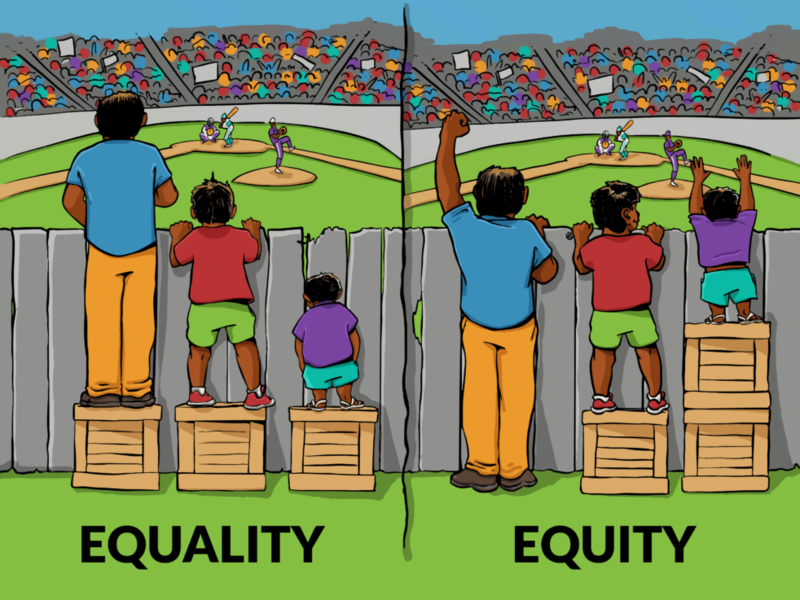 To promote equity, your college has to prioritize students above all else. I’m going to be controversial here, but I feel I have to. I believe that tenure hurts underprivileged and underrepresented students and it should be dropped. If you are concerned that this will hurt you college’s ability to conduct research, then I’m going to stop you right there and ask why colleges are in the business of conducting research at all? Spin off your research programs and separate them from the educational programs. Make one focus on students learning, the other on creating new knowledge. Any college less than student centered is going to find scenarios where they put the good of some other group (researchers, tenured professors, etc) over the good of students. That is, in my opinion, contradictory to being a place of learning. Finally provide training to the relevant teachers in trauma informed practice. It is very hard to learn when one has been traumatized by difficult experiences in one’s past. Through trauma informed practices, however, educators can help this population of students to cope and grow through their traumas.